Bounce U is an inflatable bounce house childrens attraction that contains several large bounce houses and slides for kids to play around with. Orlando Local Guide recently held a birthday party for a group of 2 years olds at the Sanford location and all participants had a great time. The party consisted of 3 rooms, the first having a standard bounce house, a large inflatable slide to go down and an air cannon section that shot nurf balls across the room. The second room had another set of bounce houses that included an extended obstacle course and a larger bounce house that was easier to walk around in without tripping. The third room was the birthday room. 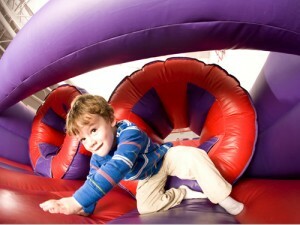 Inflatable play centers are becoming more popular for birthday parties and Bounce U is comparable to another inflatable center in Monkey Joe’s. What we liked about Bounce U for the party is that the rooms were segregated from other parties so that that the parents of our 2 years olds did not have to worry about older kids jumping around the bounce houses and trampling the little ones. This is different with the setup of Monkey Joe’s where all of the children are in one big room. We were a little worried at first that the inflatables would be a little too advanced for the age group participating, but with a little help from the mom and dads, almost all of the attractions were accessible and the kids had a great time. Click Here for other Children’s Activities Center’s around Orlando. This entry was posted in Family and tagged activities, birthday party, sanford. Bookmark the permalink.